Top photo: Winners of the recent Hackathon event, comprised of Rotman School of Management students and TD Bank Group employees. 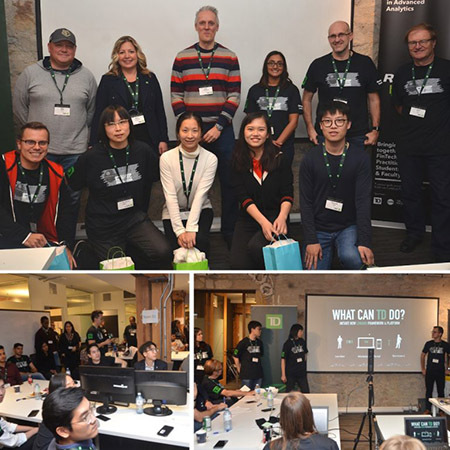 Students from the University of Toronto’s (U ofT) Rotman School of Management (Rotman) used business and analytical acumen to solve real financial problems during a recent Hackathon event, hosted Nov. 2-4 in Toronto. Paramount to the success of the event, sponsored by TD Bank Group (TD), was the flexible and reliable private cloud computing infrastructure delivered by U of T’s Information Technology Services (ITS). “The enterprise infrastructure solutions (EIS) team was able to provide the necessary computing infrastructure, along with a superior level of support, at a much lower cost than the major public cloud vendors,” said Jae Chung, manager of servers, storage and virtualization for EIS. In addition to the 60 Rotman students and 60 TD employees participating in the event, ITS staff were also on standby to provide real-time support in case of technical issues. Teams consisted of six participants, made up of about two to three TD employees and three Rotman students. Using existing data, they were asked to develop solutions to current financial issues facing the bank, including identifying patterns and segments. An example challenge was: self-employed individuals aren’t saving enough to retire; how might TD identify those customers and offer appropriate retirement planning aids to support them. Focusing on practical applications of data and analytics, students enjoyed tackling concrete financial challenges and working alongside professionals whose roles may mirror their own in the near future. Contingent on further testing, the discoveries made by the Hackathon teams may be used in the future by TD to provide better service to its customer base. The winning team was comprised of three students from the Master of Science in applied Computing, Data Science Concentration program: TX Chen, Shirly Wang and Roxanne Zhao. They each won a Google Home. First and second place students were also granted an interview to the TD rotational program for new graduates. “All in all, the Hackathon was a win for both parties,” said Latremouille. In addition to providing some of Rotman’s best and brightest minds, U of T offered TD an infrastructure model that was quick, easy and safe to use. “This demonstrates an excellent collaboration between ITS and U of T’s faculties to deliver successful technology to external partners and internal stakeholders,” he said. The event was hosted by the Rotman Financial Innovation Hub in Advanced Analytics, or FinHub, developed to expose and instruct students in cutting edge technological and finance innovations. In October 2018, TD gave Rotman $4 million in funding as part of the school’s efforts to attract and develop top data and analytics talent from around the globe.